Red2120's Club Penguin Cheats, Secrets, And Give Aways! : *EXCLUSIVE* Club Penguin Going Chinese! Plus Secret Party! *EXCLUSIVE* Club Penguin Going Chinese! Plus Secret Party! Hello everyone! Boy, do I got HUGE exclusives for you! First off I'd like to tell you, you are not aloud to steal the pictures I'm about to show you! Lets start off by telling you that Club Penguin is adding another language to the game! Check out this EXCLUSIVE PICTURE OF A LOG IN SCREEN! Amazing! Look at that picture it shows something rather, "Strange". Could it be a party coming soon? 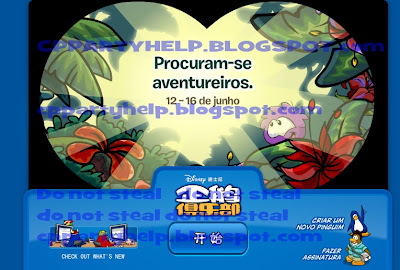 It says Procuram-se Aventureiros 12-16 de junho. But guess what?! I got a picture showing you the words translated!!! Check this out! AWESOME! SO WE ARE GETTING A EXPLORATION PARTY?!?! Sorry guys! I'm just excited! This shows how Club Penguin plans things out! I'snt it amazing how Club Penguin already has things ready for June? This makes me wonder how much more they have planned out for us! WOW!!! I can't beleive Club Penguin already has something planned for us for June!!! This is awesome!